Hello, I'm Michael Bond and welcome to our site developed for serious and reluctant investors. I am going to walk you through the TSP funds from a different perspective than you may find anywhere else. I've spent years reading a lot of faulty analysis about investing in the TSP funds and the stock and bond markets in general. Much of it comes from an academic or marketing perspective and not from basic real-world analysis. Nothing I am about to present requires a rocket scientist to understand. We are just going over some facts that are rarely discussed. Do you drive your car by looking in the rear-view mirror? You should not invest that way either - stop looking to past returns to determine where to invest in the future. We can do a pretty good job determining the winners going forward based on what's under each fund's hood. So let's start by eliminating the weakest funds from the mix - the TSP F and I fund. The TSP F fund will under-perform the TSP G fund while interest rates are rising, period. And since the TSP F fund's yield is usually very close to the TSP G fund's interest rate, it will match the G fund when interest rates are flat. The difference in performance of these two funds are the capital gains or losses the F fund sustains during the year due to interest rate movements. So unless interest rates are falling, there is no reason to be in the F fund over the G fund. This explains why the TSP Lifecycle fund for retirees currently holds 74% G fund and only 6% F fund. From the F fund’s inception until 2016, interest rates were declining and the F fund's price went up due to the falling rates. 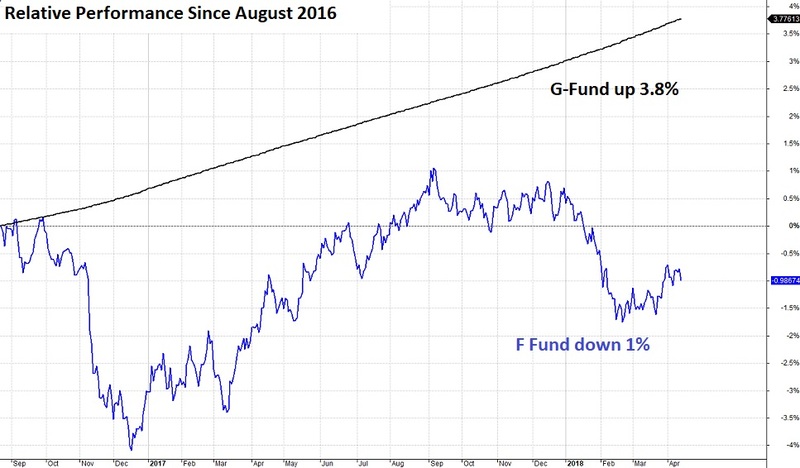 While this makes the F fund's past performance look good when comparing it to the G fund, this has not been the case since 2016. I do see some downward pressure on interest rates approaching in 2019 - a slowing economy and a pausing of interest rate hikes by the Federal Reserve. This will cause a roller coaster effect on the TSP F fund while the TSP G fund remains steady. It is important to understand that you will often see short term bounces in the F fund when the stock market sells off. Investors are simply running to safety and this causes a very short-term bump in the safer fixed income prices. This does not occur for the TSP G fund because it does not hold real securities - it is a virtual fund and its interest rate is based on a formula. When investors return to the stock market, the bump in the TSP F fund often disappears. So for long term investors, the trend in interest rates is what matters. And what is important to understand today is that the trend of declining interest rates bottomed in 2016 and is set to move higher through 2019 or at least until the next financial crisis. I am expecting another financial crisis, so does this mean the TSP F fund will become a better fund than the G fund in the near future. Bond funds come with both interest rate risk and default risk, the default risk during financial crisis means you should stick with the risk-free TSP G fund. Note: I define a "long-term investor" as someone who does NOT chase short-term movements in the market. 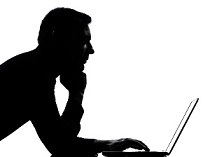 An investor, not a speculator. The International index (TSP I fund) is weighted with only 8% tech compared to 20% in the SP500. It is the 100 largest Nasdaq listed companies that are tracked in the SP500 index that helped the TSP C fund pull ahead of the TSP I fund. These are the most profitable growth companies in the developed world and most of them sit in the TSP C fund. The SP500 companies obtain 31% of their revenue outside the US, meaning the SP500 is already diversified internationally. 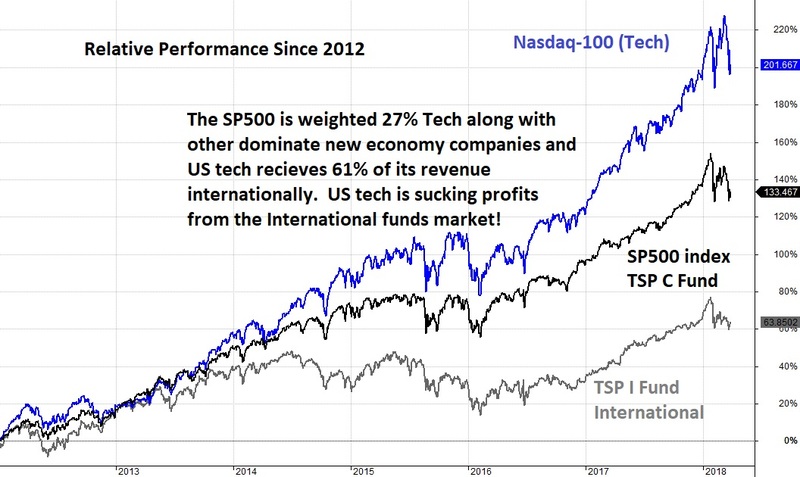 Better yet the SP500 tech sector obtains 60% of its tech revenue outside the US. When you add the I fund to your allocations, you are quickly under-weighting the world's large tech stocks. The TSP I fund is also holding over a 24% weighting in financial stocks and frankly Europe’s banks and finances are a bug looking for a windshield. The European Central Bank's manipulation of interest rates into negative territory merely covered up the European financial sector and economic problems. As interest rates rise globally those issues will resurface. 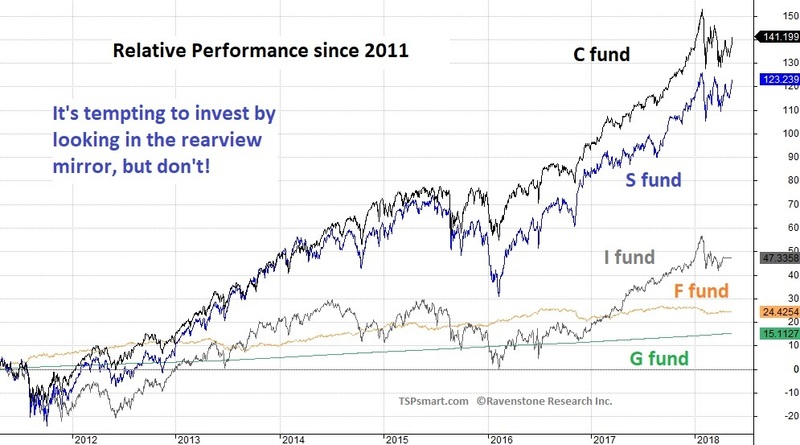 Simply put, I do not see the TSP I fund as a good long-term investment for 2019 and beyond. While the US stock market may be more over-valued today, the global stock markets were highly correlated to the downside during the last two bear markets - meaning you can not hide in international stocks when the US stock market finally rolls over. Adding emerging markets adds an additional risk to the I fund. As of December 2018, emerging markets are already down over 20% well ahead of the developed countries stocks. My additional concern on emerging markets are the lack of protections for investors in some markets which may occur during another financial crisis... or trade war turned economic war. The Lifecycle funds follow a buy and hold strategy and are simply invested in all five basic funds to include the two we think should be eliminated from the mix. 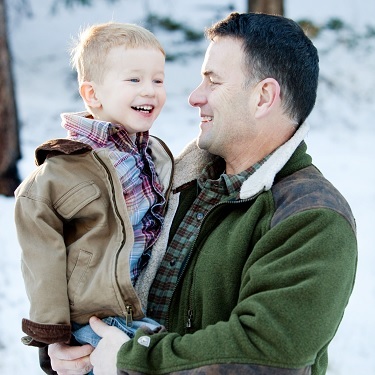 The funds are predominately invested in equities until you close in on retirement where they start shifting to the TSP G fund -- 74% in the retirement income producing fund. 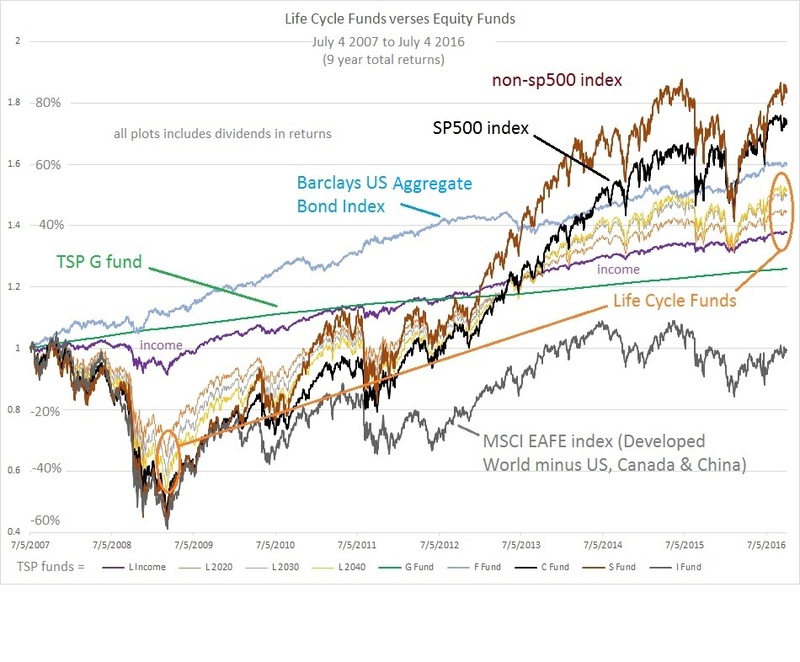 The two ovals in the next chart highlight a key point about most Lifecycle funds. They do lose less during bear (down) markets, but the gain less during bull (up) markets. This means they are less "volatile" and this is advertised as being less risky. With the exception of the Retirement Income Lifecycle fund you run the risk of large losses during bear markets. You also get the under-performance of the two worst funds during bull markets. You can do better. ...let's take a look at Part 2: The three best funds.